“Naval Blockade” or All Out War Against Iran? Shortly after this article was released on August 13, US military sources as well as Stratfor (a Strategic Studies Think Tank) stated that the various press reports (UPI, Middle East Times, Kuwait Times, Debka) regarding the naval deployment to the Middle East were incorrect. According to the press reports (see UPI, August 11, 2008), the war ships involved in the “Operation Brimstone” war games off the US North Atlantic coast, had set sail for the Middle East. This information is apparently incorrect, according to the US Navy and Stratfor. It is worth noting that the Kuwaiti government had activated emergency procedures based on the information pertaining to a major naval deployment in the Persian Gulf. The eventuality of a naval blockade directed against Iran is nonetheless being considered by the Pentagon. In fact, the naval blockade initiative is supported by a bill which was launched in the US Congress in late May. (See below for details). We have checked the most recent information regarding the movements and location of the various USS Carrier and Expeditionary Strike Groups. The text first released on August 13 has been revised. Corrections, and updates to the text are indicated. We will provide further updates and analysis as more information becomes available. The Bush administration is envisaging the possibility of launching a naval blockade directed against Iran. Extensive war games were held off the US Atlantic Coastline under “Operation Brimstone” in late July. These war games were activated shortly after the submission in the US House of Representatives (May 22), of a bill (H CON 362) which called upon the Bush administration to carry out an economic blockade directed against Iran. Joint Task Force Exercise (JTFEX) 08-4 ‘Operation Brimstone’ commenced on July 21 in North Carolina and off the Eastern US Atlantic coast from Virginia to Florida. Of significance was the participation of British, French, Brazilian and Italian naval forces as part of a multinational US naval exercise directed against Iran. Stating the purpose of a war game and identifying the real “foreign enemy” by name is not the normal practice, unless there is a decision to send an unequivocal message to the enemy. Anglo-US war games are a routine practice. What is significant in these large scale naval manoeuvres is the active participation of France, Brazil and Italy in war games which are explicitly directed against Iran. Another important precedent has been set. Brazil’s President Luis Ignacio da Silva has ordered the dispatch of the Greenhalgh Frigate, marking the first time that a Brazilian warship (under a government which claims to be “socialist”) has operated as part of a US. strike group in war games directed against a foreign country. Meanwhile, H CON RES 362 has been referred to the House Foreign Affairs Committee. A similar procedure has taken place in the Senate. The planning of a naval blockade by the Bush administration (Operation Brimstone, H Con 362) occurs at the very outset of an unfolding crisis in the Caucasus, marked by the Georgian air and ground attacks on South Ossetia and Russia’s counterattack. The timing and chronology of these related and concurrent military operations is crucial. We are not dealing with separate and unrelated military events. The war in Georgia is an integral part of US-NATO-Israeli war preparations in relation to Iran. Georgia does not act militarily without the assent of Washington. The Georgian head of State is a US proxy and Georgia is a de facto US protectorate. Russia is an ally of Iran. Russia is currently caught up in a military confrontation with Georgia. The Georgian attack on South Ossetia constitutes an act of provocation directed against Russia. It creates an aura of instability in the Caucasus, marked by heavy civilian casualties. It serves to distract Russia from playing a meaningful diplomatic and military role, which might undermine or obstruct the US-led war plans directed against Iran. Both Russia and China have bilateral military cooperation agreements with Iran. Russia supplies the Islamic Republic with military hardware and technical expertise in relation to Iran’s air defense system and missile program. Since 2005, Iran has an observer member status in the Shanghai Cooperation Organization (SCO). In turn, the SCO has ties to the Collective Security Treaty Organization (CSTO), an overlapping military cooperation agreement between Russia, Armenia, Belarus, Uzbekistan, Kazakhstan, the Kyrgyz Republic, Tajikistan. The structure and strength of military alliances is crucial. In the context of US war plans directed against Iran, the US is intent upon weakening Iran’s allies, namely Russia and China. In the case of China, Washington is seeking to disrupt Beijing’s bilateral ties with Tehran as well as Iran’s rapprochement with the SCO, which has its headquarters in Beijing. The Georgian attack on South Ossetia seeks to undermine Russia, which constitutes a significant countervailing military power and ally of Iran. The ultimate objective is to isolate Iran, cut it off from its powerful allies: China and Russia. In Washington’s mindset, the events in Georgia coupled with media propaganda, can be usefully applied to discredit and weaken Russia prior to the enforcement of a naval blockade on Iran in the Persian Gulf, which could lead into an all out war on Iran. This somewhat crude line of reasoning tends, however, to overlook America’s own military setbacks and weaknesses as well as the enormous risks to America and the World which could result from a continued and sustained confrontation with Russia, let alone an attack on Iran. In view of the evolving situation in Georgia and Moscow’s military commitments in the Caucasus, military analysts believe that Russia will not protect Iran and encroach upon a US led operation directed against Iran, which would be preceded by a naval blockade. In other words, Washington believes that Moscow is unlikely to get actively involved in a showdown with US and allied forces in the Persian Gulf. According to press reports, upon completing the North Atlantic war games on July 31st, the participating warships in “Operation Brimstone” headed for the Middle East, to join up with other carrier strike groups and a constellation of US, British and French war ships. Which Carrier Strike groups and Expeditionary Forces sailed for the Middle East upon the completion of “Operation Brimstone” remains to be ascertained. In other words, there are at present (August 14, 2008) two Strike Groups in the region: USS Abraham Lincoln, northern Arabian Sea, USS Peleliu Strike Group, northern Arabian sea. There is no confirmation as to whether the USS Ronald Reagan is moving towards the Arabian Sea. US Central Command (CENTCOM) under the helm of General Petraeus, coordinates out of Bahrain so-called Maritime Security Operations (MSO) in Middle East waters ( Gulf of Aden, Gulf of Oman, Arabian Sea, Red Sea and Indian Ocean). This MSO initiative is conducted by the Combined Maritime Force (CMF) with a powerful armada of 36 warships. Established at the outset of the Iraq war, CMF involves the participation of the US, Canada, Australia, UK, Germany, Australia, Italy, the Netherlands, New Zealand, Portugal, Spain, Turkey and Pakistan. In the present context, this multinational naval alliance, will be used to encroach upon maritime trade with Iran as well as play an active role in implementing the proposed economic blockade of Iran. 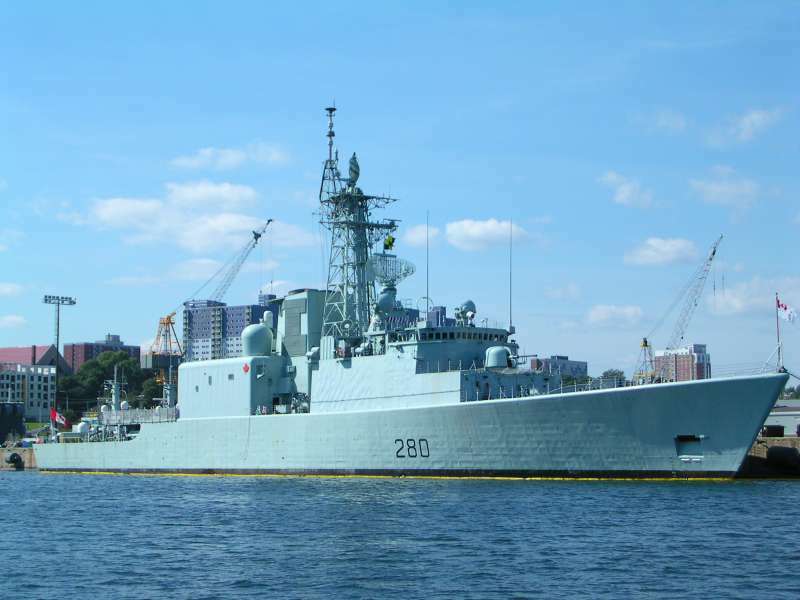 Canada has recently deployed three war ships to the Arabian sea, including HMC Iroquois along with HMC Calgary and HMC Protecteur which will be operating under CTF 150, which is responsible for MSO in the Gulf of Aden, the Gulf of Oman, the Arabian Sea, the Red Sea and the Indian Ocean. Canada’s HMC Iroquois, involved in Maritime Security. RBNS Sabha (FFG 90) – The Bahraini flagship of CTF 152 conducting Maritime Security Operations (MSO) in the Central and Southern Arabian Gulf. USS Harry S. Truman (CVN 75) – The U.S. flagship of CTF 50, conducting MSO in the Central and Southern Arabian Gulf , as well as support Operations Enduring Freedom and Iraqi Freedom. (currently in the Atlantic Ocean according to Stratfor). FS Guepratte (F 714) – French Navy ship operating as part of CTF 150 in the North Arabian Sea, Gulf of Aden, Gulf of Oman, Red Sea and the Indian Ocean. USCGC Wrangell (WPB 1332) – One of several USCG 110’ patrol boats conducting MSO in the North Arabian Gulf. HMAS Arunta (F 151) – Australian Navy ship conducting MSO as part of CTF 158 . PNS Tippu Sultan (D 186) – Pakistan Navy ship conducting MSO as part of CTF 150. RFA Cardigan Bay (L 3009) – British Royal Navy auxiliary ship operating with CTF 158. USS Port Royal (CG 73) – US Navy guided-missile cruiser deployed with USS Tarawa Expeditionary Strike Group. The first stage of a naval blockade directed against Iran would in all likelihood be initiated by Maritime Security Operations (MSO) under USCENTCOM. More recently, a December 2007 NATO sponsored report entitled “Towards a Grand Strategy for an Uncertain World: Renewing Transatlantic Partnership“. calls for a first strike pre-emptive use of nuclear weapons. The NATO doctrine in this report is a virtual copy and paste version of America’s post 9/11 nuclear weapons doctrine as initially outlined in the 2002 Nuclear Posture Review (NPR). The preemptive use of nukes as formulated in the NATO Transatlantic Partnership document would be used to undermine an “increasingly brutal World” (e.g. Iran) as well as a means to prevent “rogue enemies” to use “weapons of mass destruction”. Under this NATO framework, which is explicitly envisaged in relation to Iran, US and allied forces including Israel would “resort to a pre-emptive nuclear attack to try to halt the imminent spread of nuclear weapons, ” (quoted in Paul Dibb, Sidney Morning Herald, 11 February 2008). In terms of the ongoing threats directed against Iran, a pre-emptive nuclear attack using tactical nuclear weapons, which are according to the Pentagon is “harmless to the surrounding civilian population” could be carried out in relation to Iran, even if if Iran does not possess nuclear weapons capabilities, as confirmed by the 2007 National Intelligence Estimate (NIE). According to a 2003 Senate decision, the new generation of tactical nuclear weapons or “low yield” “mini-nukes”, with an explosive capacity of up to 6 times a Hiroshima bomb, are now considered “safe for civilians” because the explosion is underground. In an utterly twisted logic, nuclear weapons are presented as a means to building peace and preventing “collateral damage”. The US-NATO doctrine to use nukes on a pre-emptive basis against Iran, with a view to “saving the Western World’s way of life”, is not challenged in any meaningful way by the antiwar movement. The mainstream media has a strong grip on the public’s perception and understanding of the Middle East war. The dangers of nuclear war in the Post cold War era are barely mentioned and when they are, the use of nuclear weapons are justified as a preemptive military option to ensure the security of Western World. The truth is twisted and turned upside down. Media disinformation instills within the consciousness of Americans and Europeans that somehow the war on Iran is a necessity, that Iran is a threat to the Homeland and that the Islamic Republic is supporting Islamic terrorists, who are planning a Second 9/11. And that a pre-emptive nuclear attack is the answer. In contrast, the powerful economic interests behind the war economy, the Anglo-American oil giants military, the defense contractors, Wall Street are rarely the object of media coverage. The real economic and strategic objectives behind this war are carefully obfuscated. 9/11 is used profusely both by the Bush administration and the media as a justification for waging war, despite the fact that there is mounting evidence of cover-up and complicity of key members of the Bush Administration. At present US and coalition forces including NATO and Israel are in an advanced state of readiness to launch an attack on Iran. Leaders of the US led coalition including France, Germany and Italy, should understand that such an action could result in a World War III scenario. Escalation scenarios have already been envisaged and analyzed by the Pentagon. US sponsored war games have foreseen the possible intervention of Russia and China in the Middle East. World War III has been on the lips of NeoCon architects of US foreign policy from the outset of the Bush regime. War propaganda, through media disinformation consists in galvanizing US citizens not only in favor of “the war on terrorism”, but in support of a social order which repeals the Rule of Law, derogates fundamental civil liberties, upholds the use of torture and establishes a modern police state apparatus as a means to “preserving Western democracy”. There is a tacit public acceptance of a diabolical and criminal military agenda, which in a very sense threatens “the community of nations” and life on this planet. In the course of the last four years, Global Research has documented in detail the various war plans directed against Iran. Operation TIRANNT (Theater Iran Near Term) was initially formulated in July 2003, in the wake of the US led Iraq invasion. We have done our utmost to reverse the tide of media disinformation, to inform our readers and the broader public on the impending dangers underlying the US military adventure. This is the most serious crisis in modern history which in a very real sense threatens the future of humanity.